As per the contract, Kanoo Machinery, which is a leading provider of construction equipment, mobile cranes, and material handling equipment, will supply five units of high capacity forklifts at 10-, 16- and 44-tonne which are known as big trucks. These big trucks are customised with special adaptations and rotary attachments to work in the cast house where they will be subjected to elevated temperature and tough operating conditions. “These sophisticated and customised applications (high capacity forklifts with rotator attachments) will be a benchmark for Kanoo Machinery and Ma’aden. 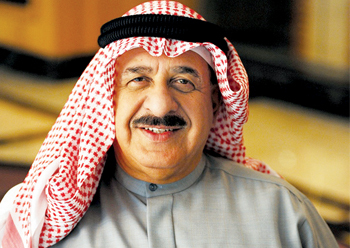 They will be the first in Saudi Arabia for Kanoo Machinery to be supplying on rental basis, especially the 44-tonnes high-capacity forklift,” the company’s latest newsletter stated. Ma’aden Aluminium (MA), a joint venture between the Saudi Arabian Mining Company (Ma’aden) and Alcoa, is a supplier of high quality primary and rolled product solutions to customers in local and international markets. MA’s facilities consist of a bauxite mine at Al Ba’itha in Qassim province in the centre of Saudi Arabia, which connects by railway to an alumina refinery, aluminium smelter, can sheet rolling mill and automotive mill at Ras Al Khair, 90km north of Jubail in the Eastern Province. Five years after its establishment, Ma’aden Aluminium is now a fully integrated aluminium processing complex in a joint venture with Alcoa. Once fully completed, the $10.8 billion project will become the largest and most efficient integrated aluminium complex in the world. In line with MA’s project expansion, the company has requirement for a huge fleet of material handling equipment to support its vast operations. Kanoo Machinery received a new invitation to bid to get machines on long term rental basis in the first quarter of 2018 to support their own existing fleets. Ma’aden Aluminium aims to focus more on its core business, eliminating the burdens of maintenance cost, huge capital investment and reduce manpower cost. Kanoo Machinery said it won the project owing to its high reputation as a reliable rental service provider with strong credibility as a business partner, as well as possessing a reputable brand of high-capacity forklifts at competitive rates. Kanoo Machinery has been able to capitalise on the dynamic shift in the marketplace toward rental options versus sales options by being able to offer unique solutions to customers such as Ma’aden and others through long-term rental contracts. The current portfolio of its rental customers includes various blue-chip companies such as Saudi Aramco, Ma’aden, Pepsi, and SA Talke, with over 600 pieces of equipment in its rental fleet. The business which was established in the early 1960’s operates showrooms and distribution channels across the region in countries like Bahrain, the UAE and Oman. Meanwhile, a new Kanoo Machinery spare parts showroom was opened in Jeddah by Yusuf bin Ahmed Group acting CEO Ahmed Fawzi Kanoo in the presence of prominent customers, invitees and senior company executives. The showroom is the sixth spare parts outlet in Saudi Arabia, demonstrating Kanoo Machinery’s growth. The showroom’s presence aims to assist customers interested in buying genuine spare parts including those from Perkins, Grove, Hysters, HIAB and Bredon.